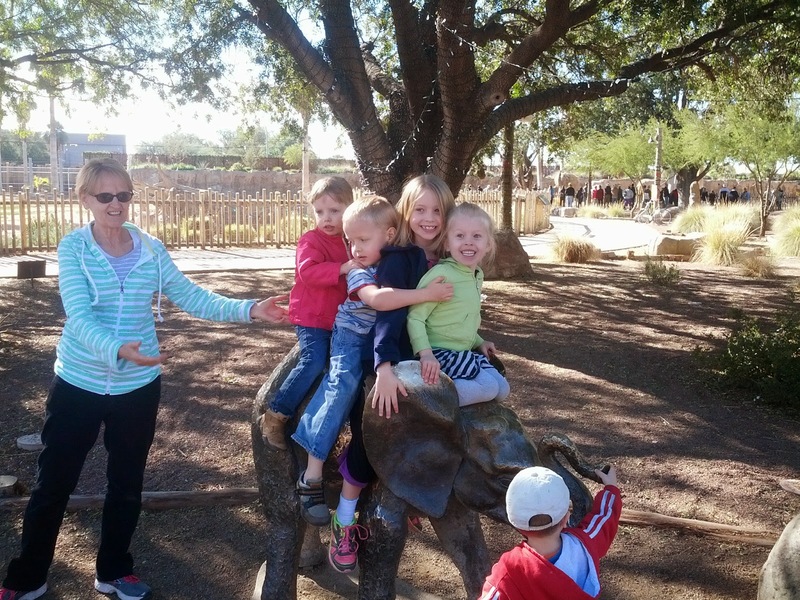 Desert Museum and Happy New Year! I know I'm posting a lot, but these cousins are just so stinking cute together. 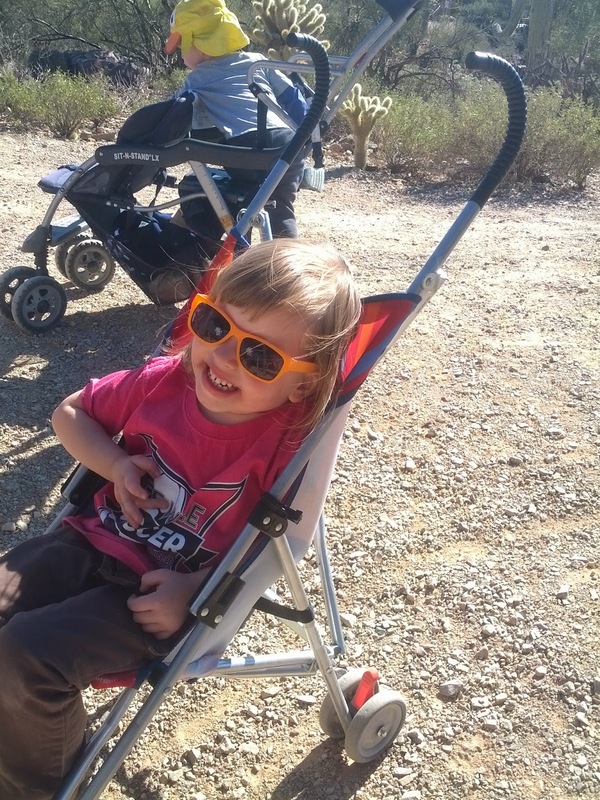 On Tuesday we went to the Sonoran Desert Museum to take advantage of Grandma's membership before it expires at the end of the year. Todd and B stayed behind at Grandma and Grandpa's house because they had both been up a lot the night before and needed some rest. 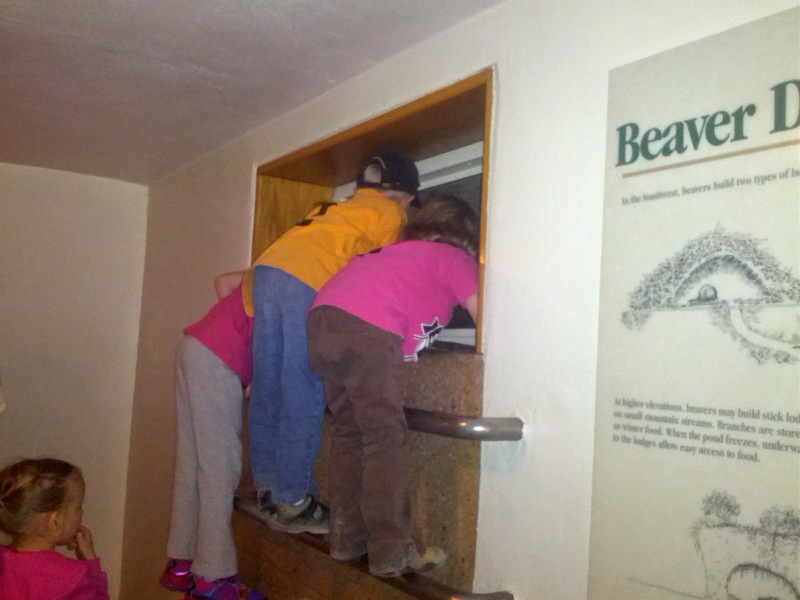 Here are some kids looking at sleeping beaver. 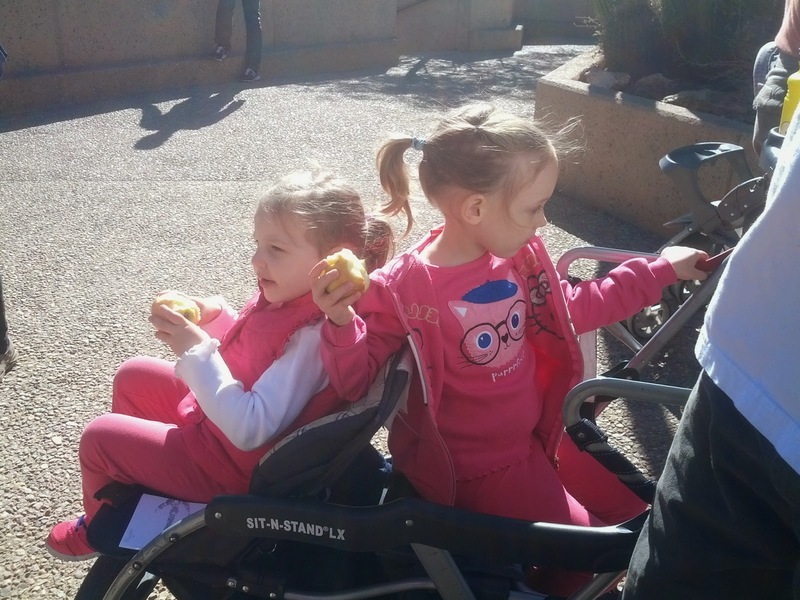 Peyton and McKenzie in the coveted stroller seats. The desert museum has a LOT of walking. Ryan, a bunch of cute little blondies, and a bobcat on a ledge. My fifth attempt at a picture of these two girls sitting "squishies" together on a seat designed for one person. Why is it so hard to get two girls to look and smile at the same time? A coyote up close as it paces its fence line. 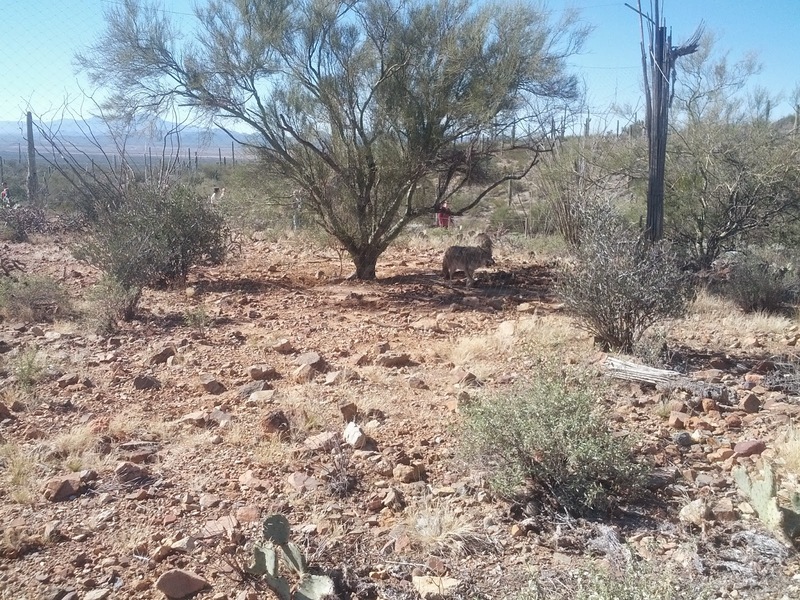 We also saw javelinas sleeping in the sun an owl, a hawk, some frogs, tarantulas, and a zillion different types of cactus. The kids collected animal print stamps in their notebooks. Eloise was exhausted by the time we left. She slept in the car for the whole hour back to Grandma and Grandpa's house. Jared was a really good sport about all of the walking. 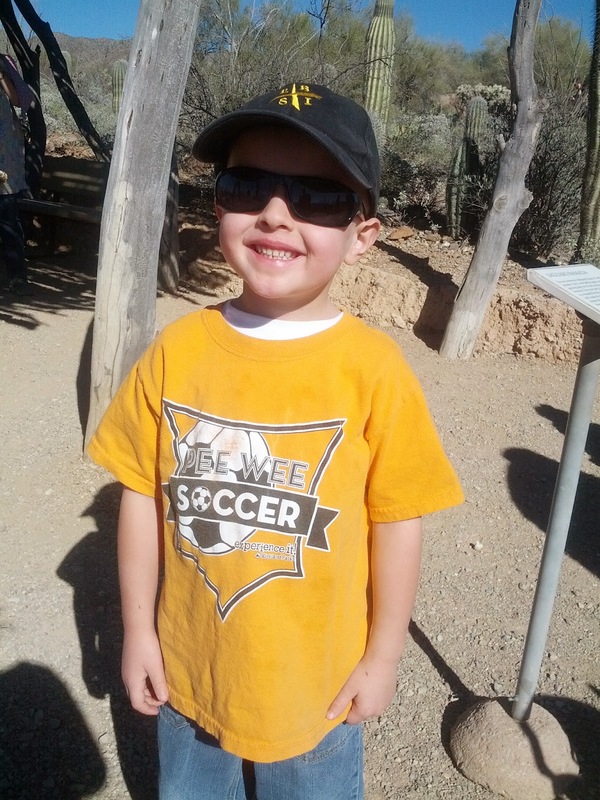 He hasn't stopped getting excited about learning different varieties of cactus, and different components of the desert ecosystem. 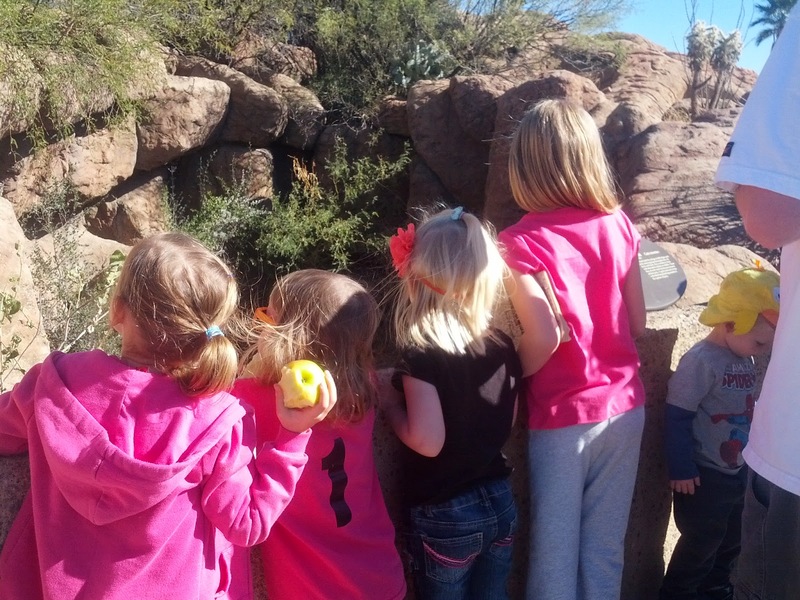 All of the kids loved crawling through the artificial caves and learning about how caves are formed, what lives in caves, and the geology of the Sonoran desert. The weather was gorgeous with a little wind coming up toward the end. 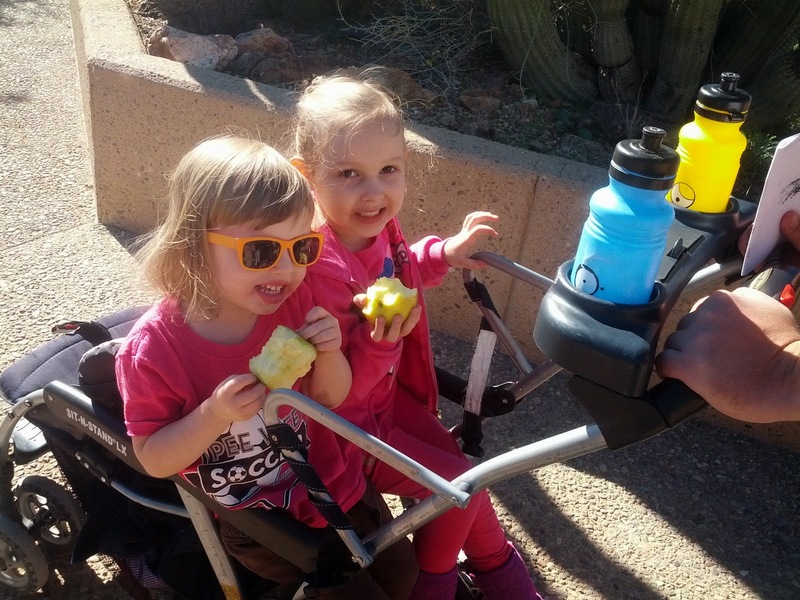 I'm so glad we got to visit the desert museum. When we got back, I took a well rested B to the store for dog food and diapers. 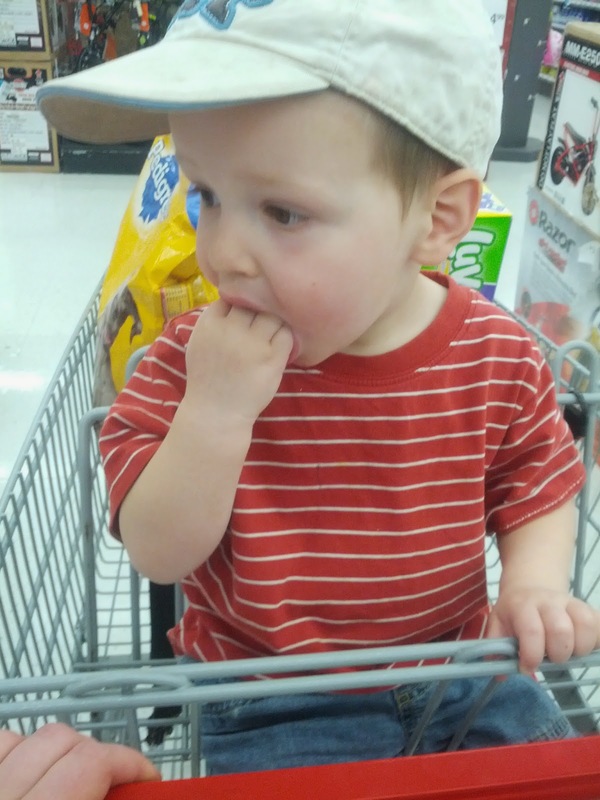 I think he must be getting some two year old molars, because he spends a lot of time with his whole fist in his mouth. He just sprouted his final canine tooth last week. Today we spent some time with the Hoefferles, doing pretty much exactly what we would have been doing at home on a sunny day. 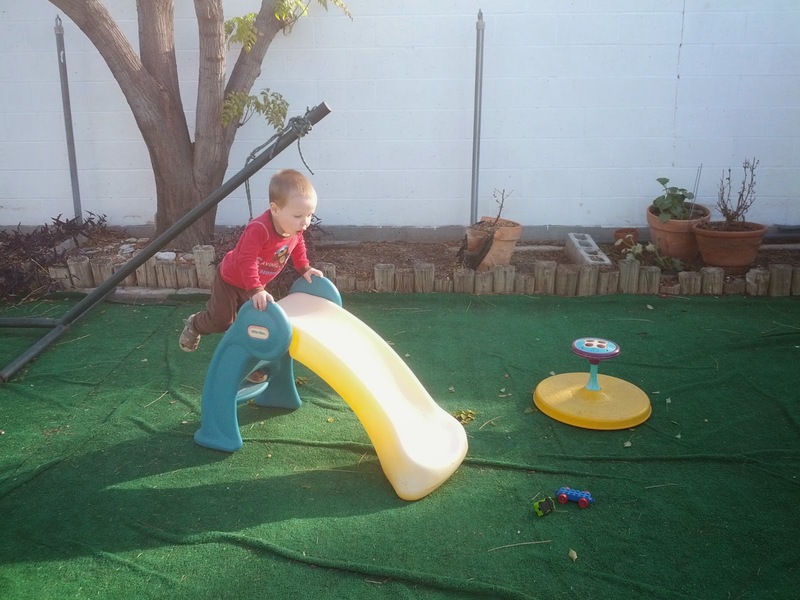 They just happened to have bikes that were just right for everybody, a playground in the backyard, and some books for Jared to hide with when he was ready for a break. This afternoon all of the cousins came over to Grandma's again to ring in the Cape Verde new year at 6:00 local time. Grandma and Grandpa's stove exploded yesterday, so we had hot dogs warmed up on the electric griddle, played charades, and then Grandma handed out noisemakers (which she instantly regretted), and we went outside in the rain to do sparklers on the patio. 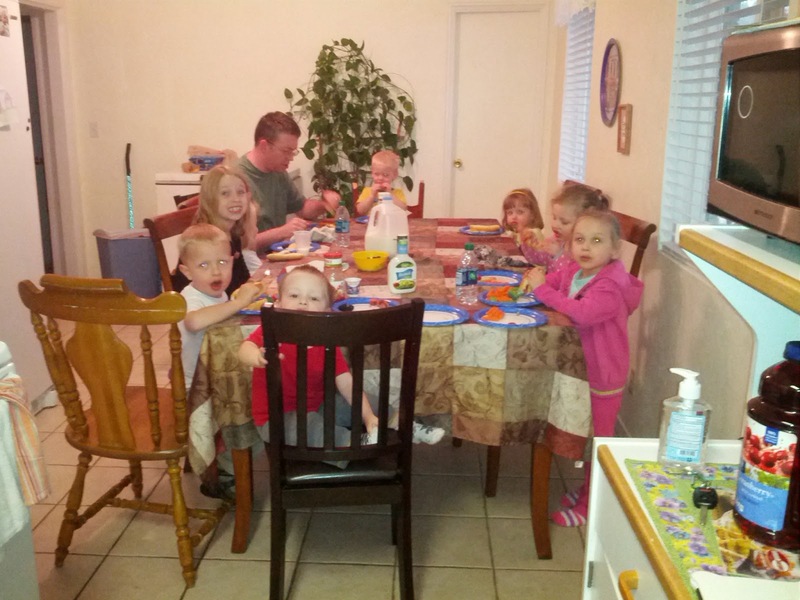 The kids have taken over the big table, and the adults get the small table now. A lot has changed in the last five years. My pictures used to be mostly grown ups, with the odd baby thrown in. Now we see the occasional adult accidentally appearing with the kids. Children just make holidays so much more fun. Ha! 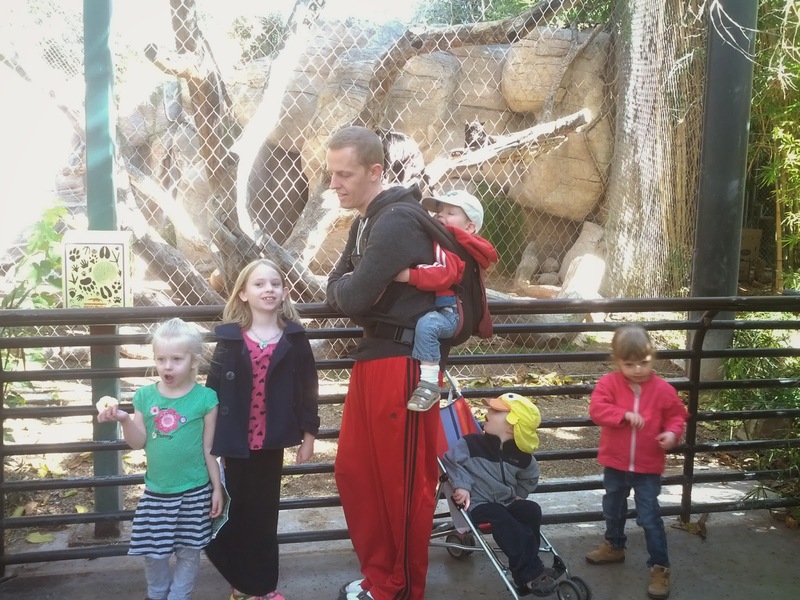 You thought this post was going to be about a trip to the zoo, but it is actually about the Campbell's house when we spent two nights with them. Four adults and seven kids made for some crazy times. Okay. 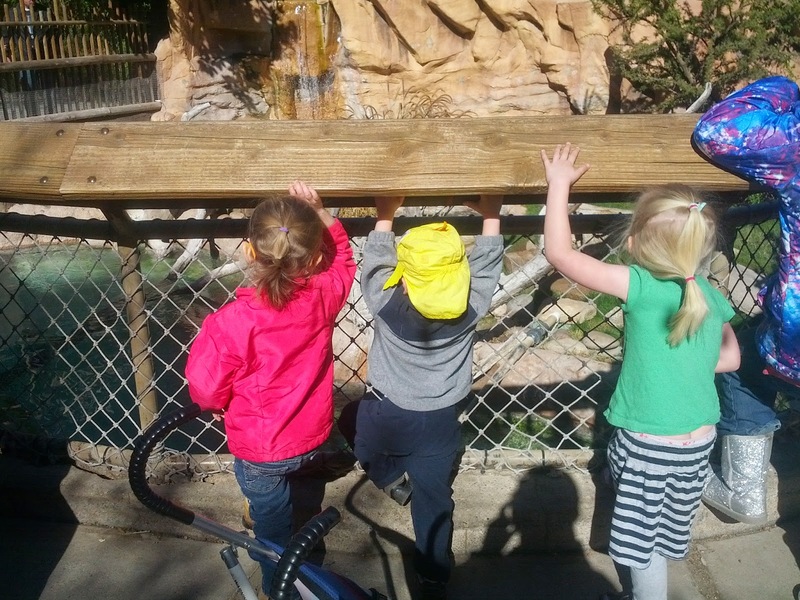 We also went to the zoo. First things first, though. Todd took me on an awesome mystery date. He didn't tell me where we were going, just a few things I should bring. We ended up meeting a bunch of friends for lunch, playing games, going to a movie, eating dinner at Tucson's only five star restaurant, and spending the night in a suite in a resort. It was a cold night, but we still got to go for a swim in a heated outdoor pool where we saw shooting stars. It was pretty magical. 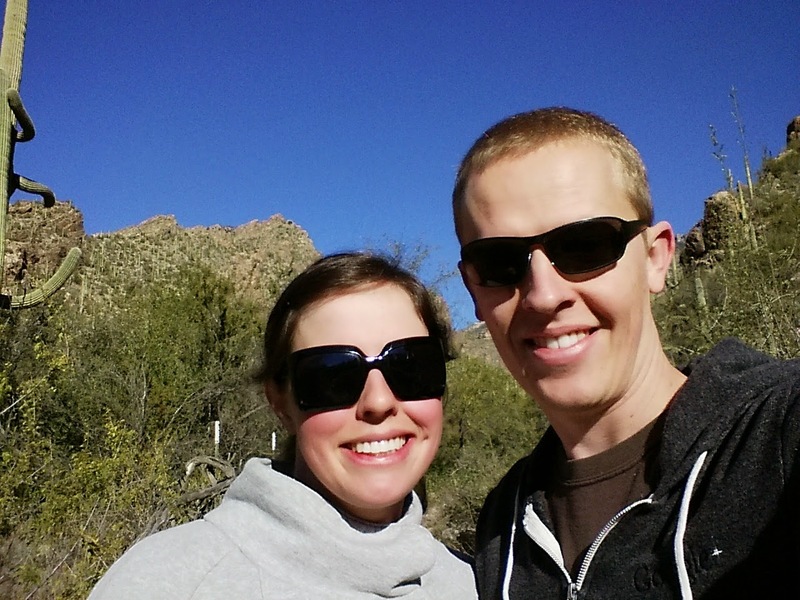 In the morning we went for a hike in Ventana Canyon before heading back to Grandma and Grandpa Knight's house to rescue them from our kids. Best Christmas present ever. On Sunday our kids made it in their Sunday clothes long enough for us to get a squinty Arizona sun-in-our-eyes portrait. Nothing says Christmas time like cactus and sunshine. 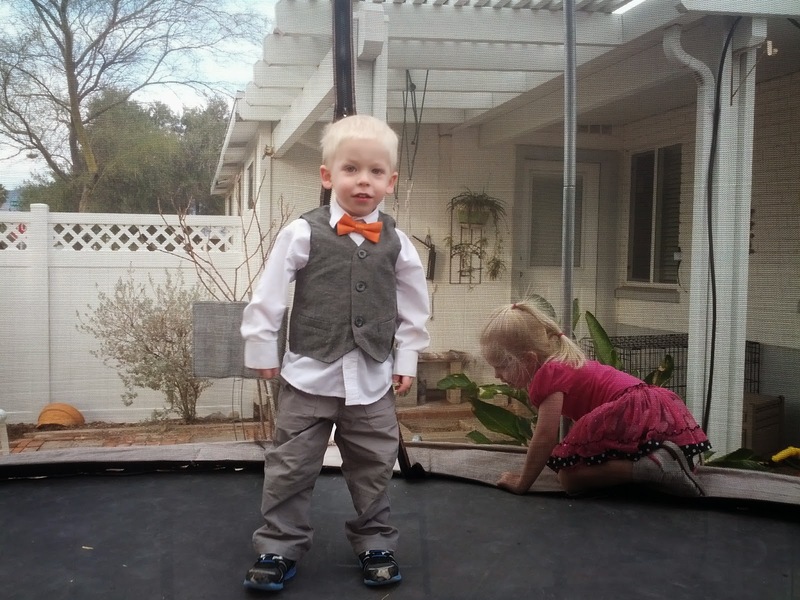 I seriously have the cutest nieces and nephews. Don't even argue with me. They are the cutest. Ryan loves to be tickled, so we get along great. We spent Sunday and Monday nights at the Campbell's house. On Monday morning Todd, Grandma, and I took all of the kids except for baby Megan to the zoo while Colette and Jacob took their Christmas decorations down. It was pretty fun, except that the Campbell children do not seem to have any sense of keeping a safe radius around their attending adult like the Knight children do. B called to Annie a lot, "Mum BACK, Annie! Mum BACK!" 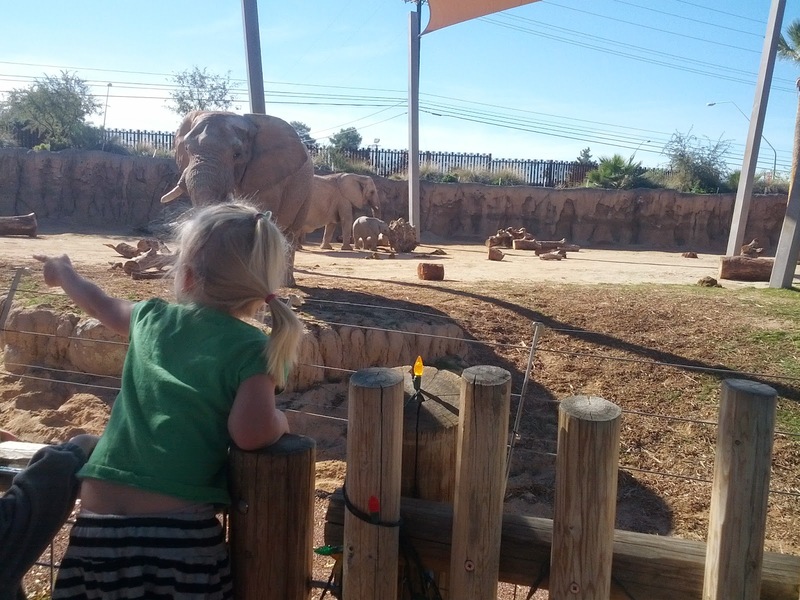 We were all excited to see the baby elephant. Did you know that elephants grow for their entire lives? The zoo in Seattle has two elephants, and they are both over thirty years old. This little guy (in the back) looked tiny to us. B and Ryan are totally cute together. B loves all of his cousins. 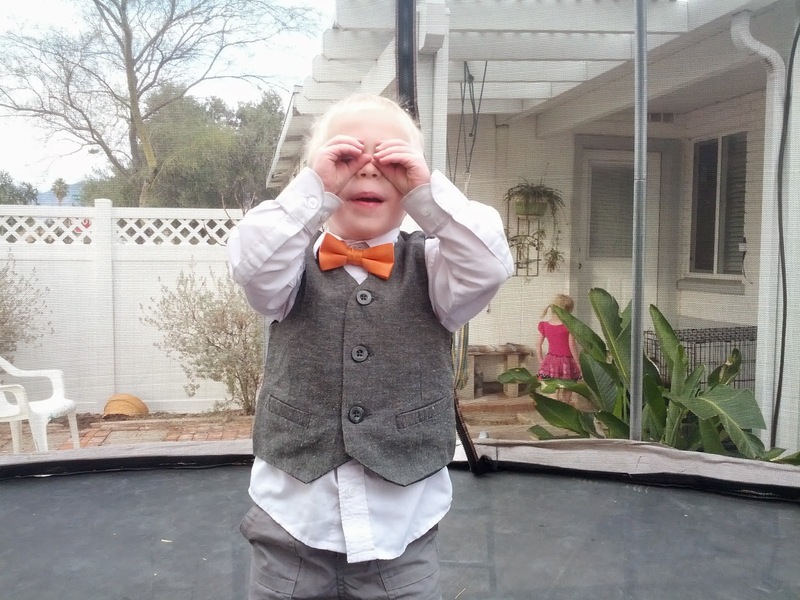 He plays chasing and tickling games with Rachel, looks out for Annie and calls for her to come and play with him, enjoys exactly the same toys and games that Ryan likes, and takes turns with him very well, and makes faces and gives kisses to baby Megan. He gets Peyton and McKenzie mixed up, but tackles them with hugs whenever he sees either of them. Eloise wanted her hair done like Annie's. Maybe cousin influence will lead her to want her hair done more often. She has dodged the hairbrush less on this trip than ever in her life. Here is our very sad attempt to get a group picture with some panthers. Note for future outings: get the group picture first while everyone is still in a mildly compliant mood. 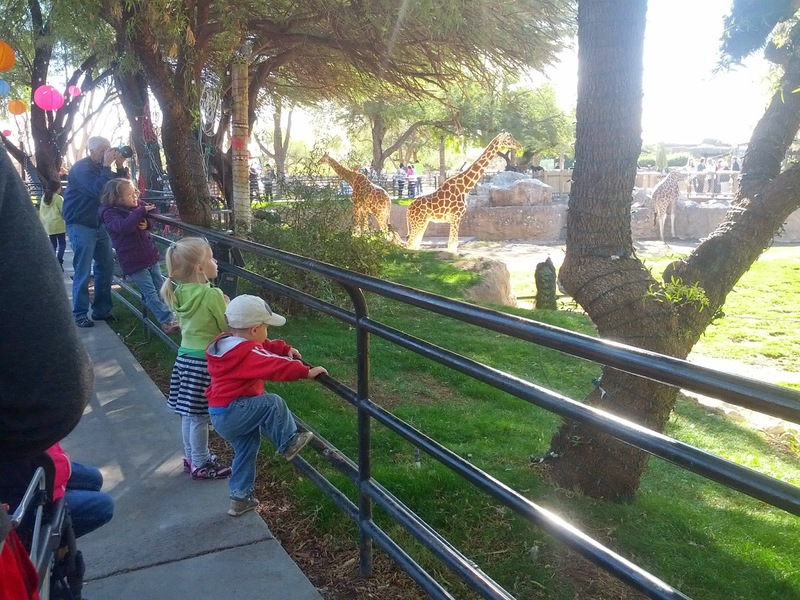 I believe I put it off this time because there was so much excited energy when we arrived at the zoo that it was impossible to corral the mob. We gave it our best effort. We know it was a successful day because we had three sleepers when we got home, all with their heads tilted to the same side. Awwwwwww. 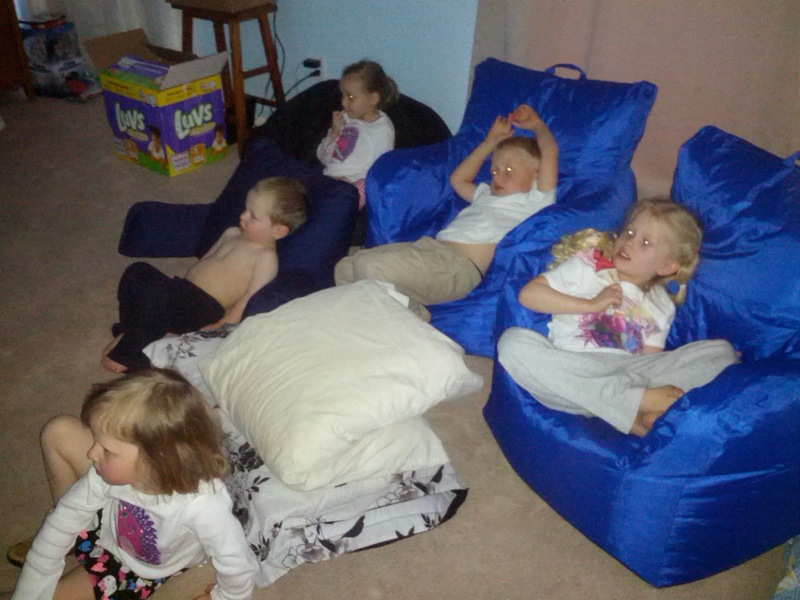 Cousin sleepovers are the best. Christmas morning was very fun, except for a little problem with Jared's clock resetting itself so that he thought it was morning really really early. 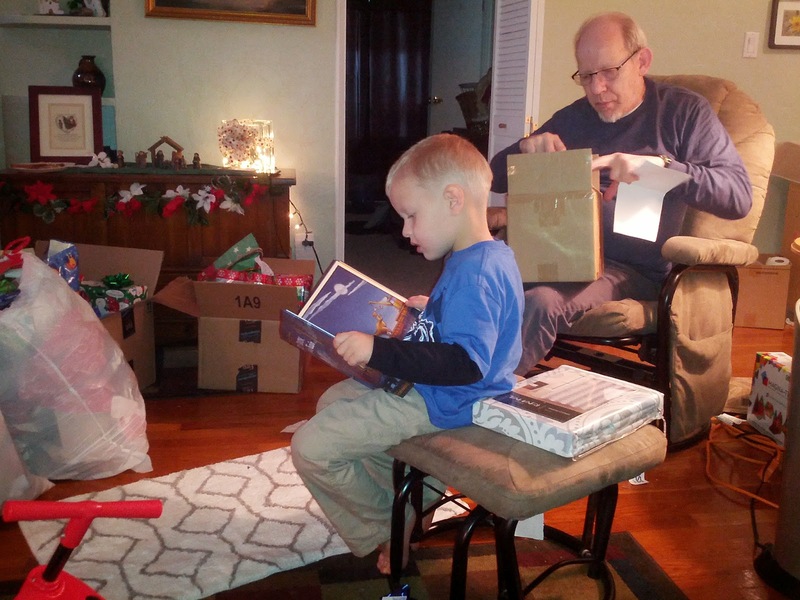 When all of the children were finally awake, they waited impatiently for Grandpa to get up so that we could open presents. I wish I had a picture that captured Eloise's face when she saw that Santa had brought her the dolly that laughs and cries that she asked for. Actually, it just laughs, but she wasn't too picky. Jared was the first one dressed because he had to put on his new clothes from Grandma and Grandpa as soon as he opened them. Present opening took a while because everything had to be opened and then played with. Todd got me a new oven mitt with a note that said, "You will need this for our hot date tomorrow." Woohoo! I got a date with Todd! 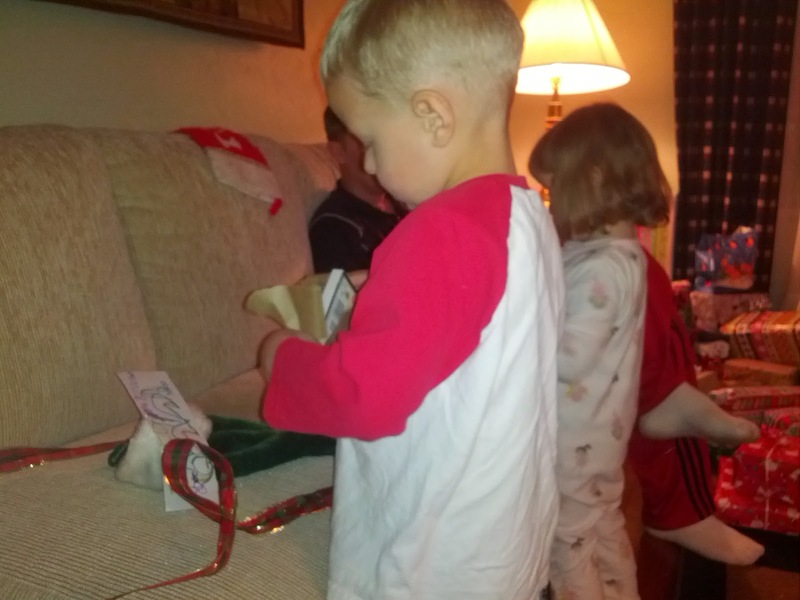 All of the presents were appreciated and enjoyed. Thanks, family! B thought that present opening was an irritating interruption to playing with the train he got in his stocking, but he was persuaded to open a few things. After a quick play outside, we headed to the Campbell's house for more presents and Christmas dinner. 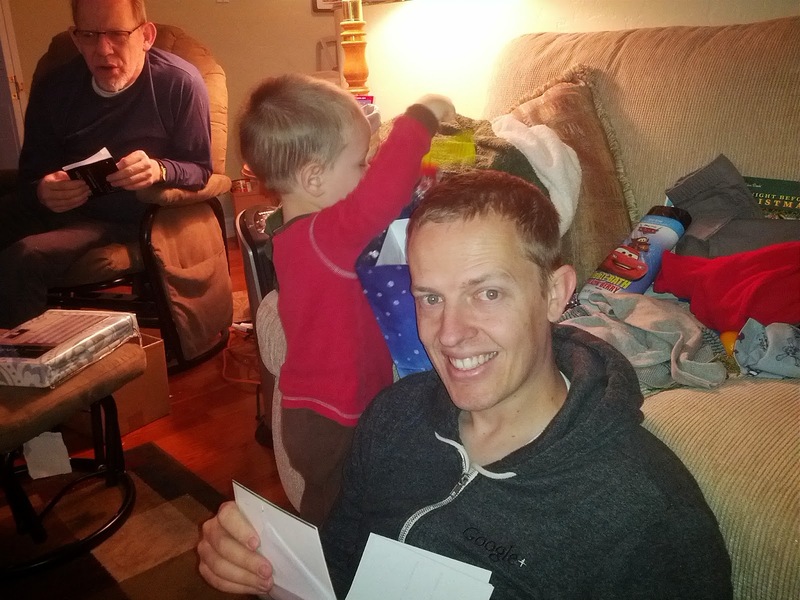 The cousin gift exchange was chaotic and fun. 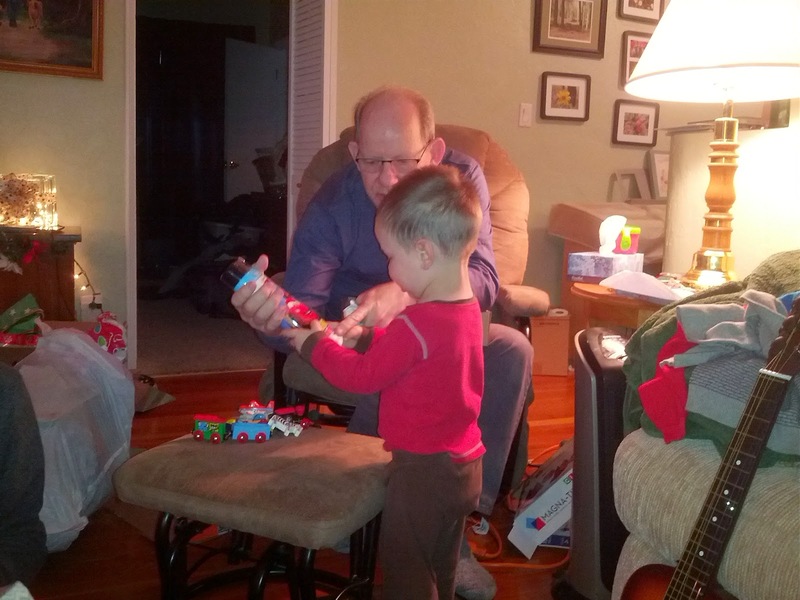 B loved his car racer made out of empty wrapping paper tubes. 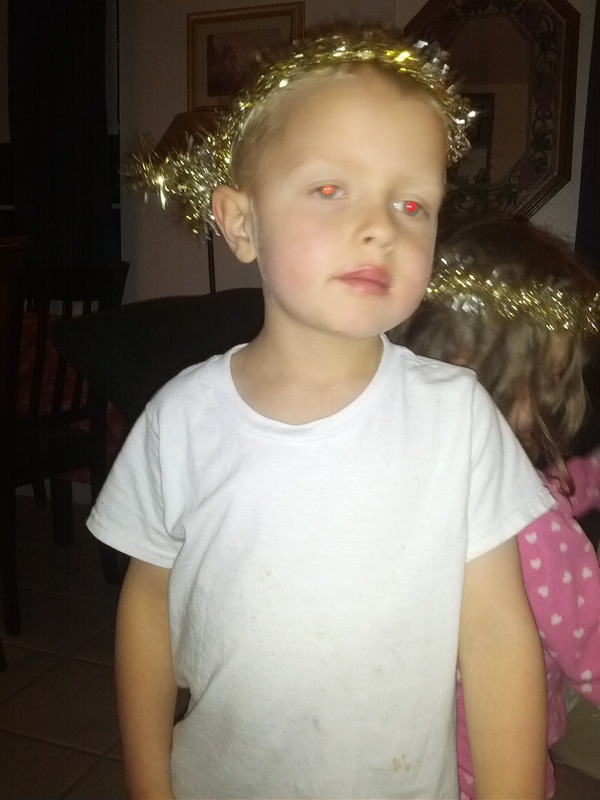 Eloise loved her riding horse, and Jared loved his crown and light up sceptre. Colette made a delicious Christmas dinner. We had a turkey, a ham, rolls, corn, vegetables (including tomatoes from Colette's monster tomato plant that will never die), five pies, stuffing, baked potatoes, and candy. B ate lunch while everyone else was still playing with their gifts, and then went upstairs to nap in Annie's bed. After B's nap, all of the kids watched "Planes" (B's present from Santa) on the projector that the Campbells got for Christmas. The adults played a game downstairs. 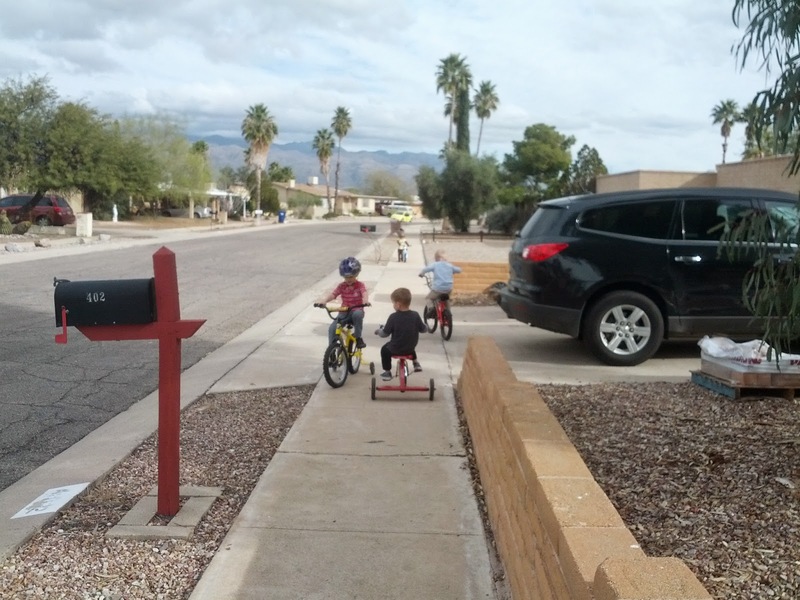 Were these kids ever tired when we got home. The day after Christmas we got to video conference with my entire family bright and early in the morning. We even got to see our missionary, although his resolution was not very good, since he had to call from a cyber cafe, and we could hear his Argentinian companion hollering at his family on the next computer over. It was great to see him, and everybody. 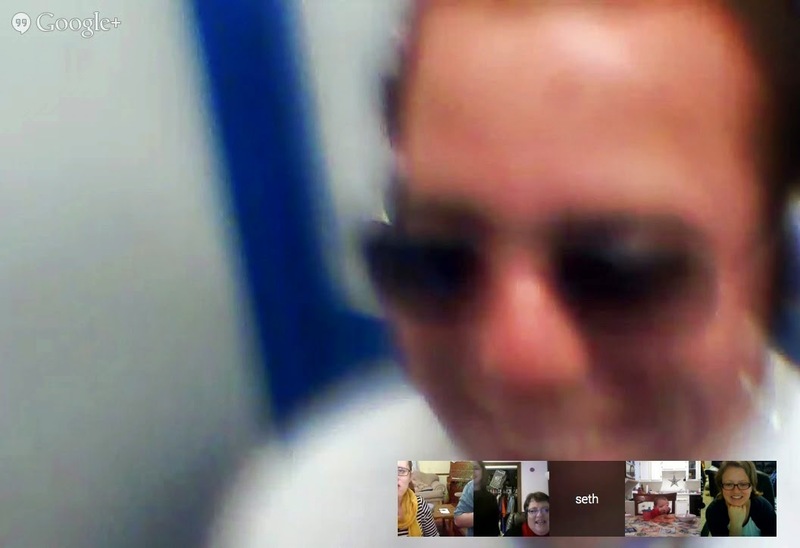 I don't think my kids remember Uncle Seth very well, but he will be home in a year and a half, and he seems happy. He is going to get to enjoy Christmas for a few weeks as our Christmas packages drift through customs. Merry Christmas everyone! 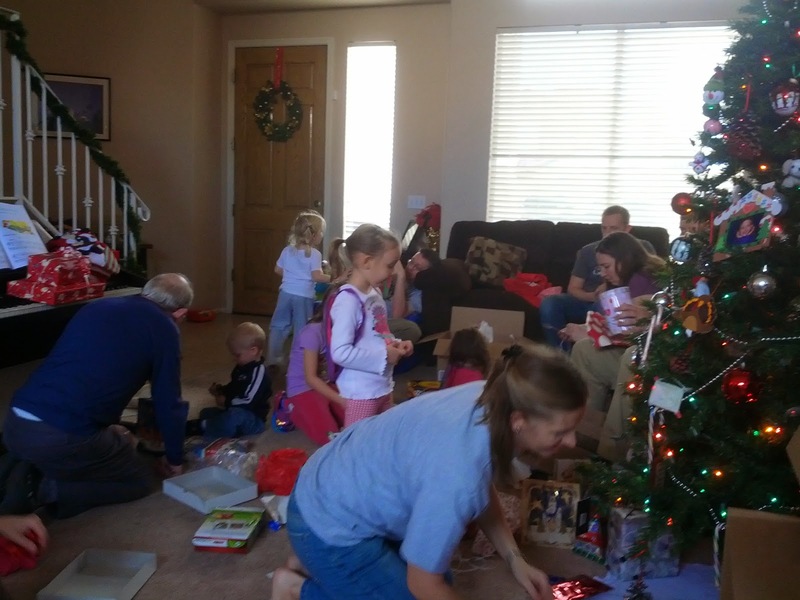 I hope your Christmas was as full of family and fun as ours was. And then it was Christmas Eve! On Christmas Eve, Rachel arrived dressed as a cat. Making costumes any day of the year is a novel idea, not to be quickly abandoned. If we can't find Jared or Rachel anywhere, we will usually come upon them like this. 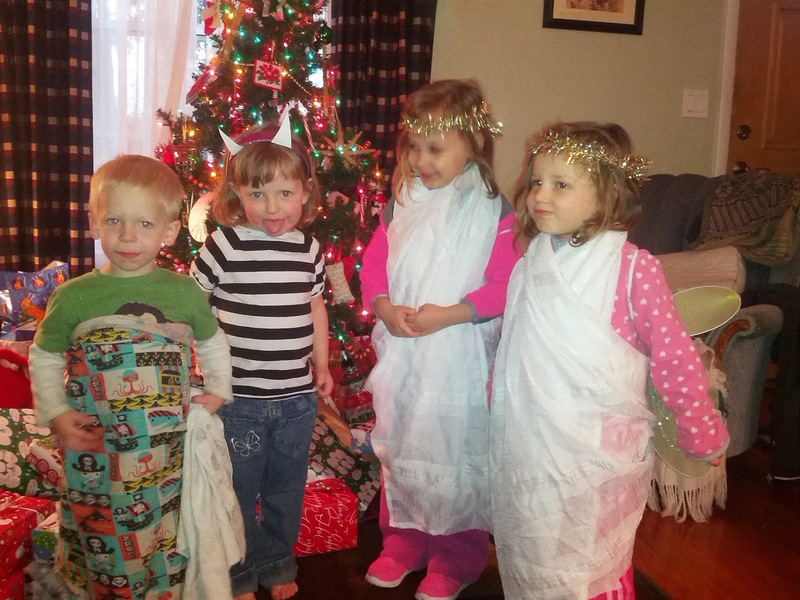 Christmas Eve means lots of treats, play, Santa tracking as he traveled across Africa, and our annual nativity reenactment. 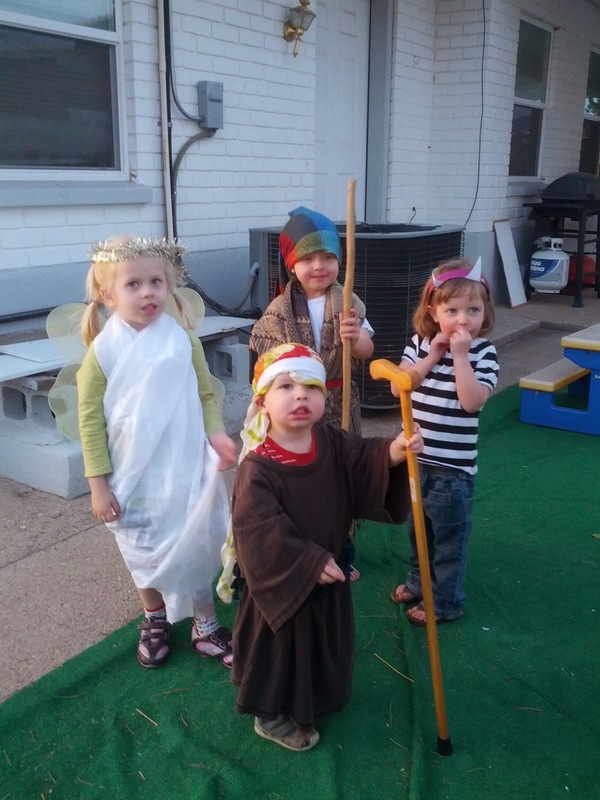 Last year I remember all of the girls arguing about who got to be Mary. 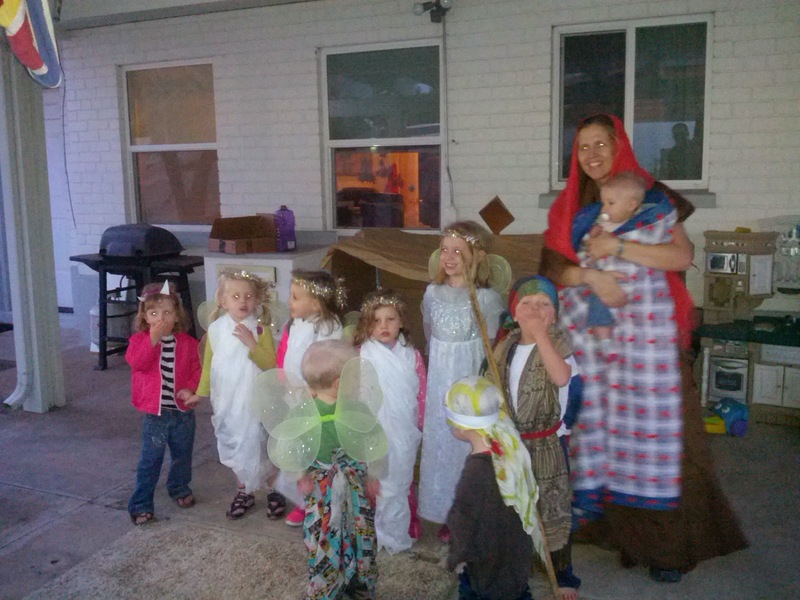 This year we had an abundance of angels, and Colette had to be Mary. 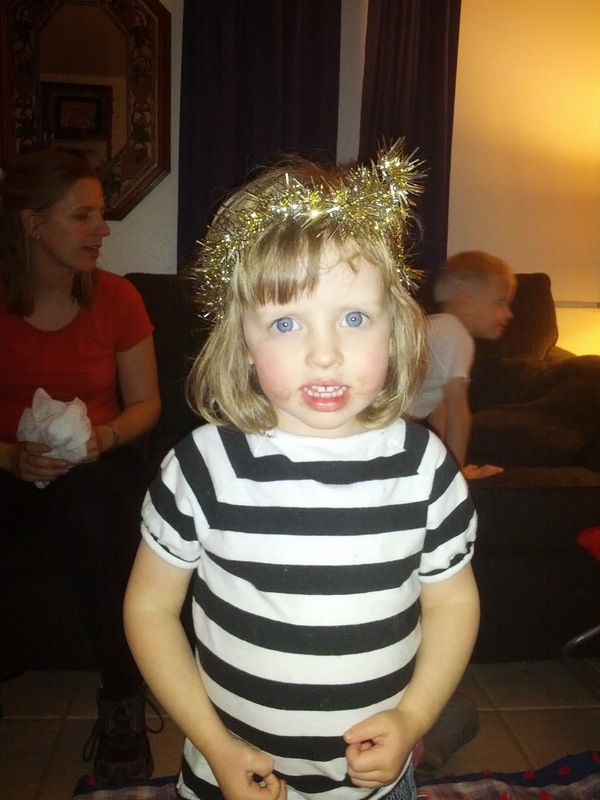 Eloise borrowed Rachel's cat ears to complete her zebra costume. We went to a display of hundreds of nativity scenes from all over the world in Bellevue the week before we left for Arizona, and Eloise became convinced that no creche is complete without a zebra. She was happy to claim that role. 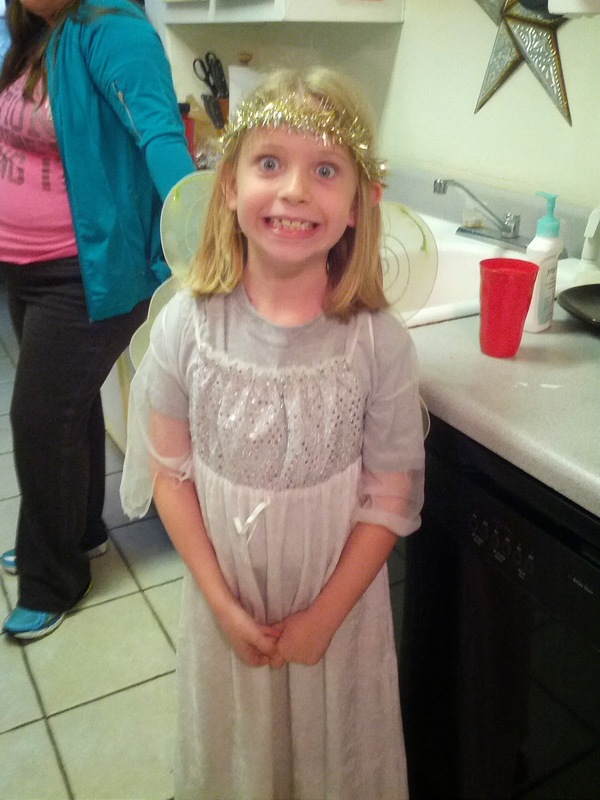 Colette brought a bunch of dress up clothes to use as costumes for our play. 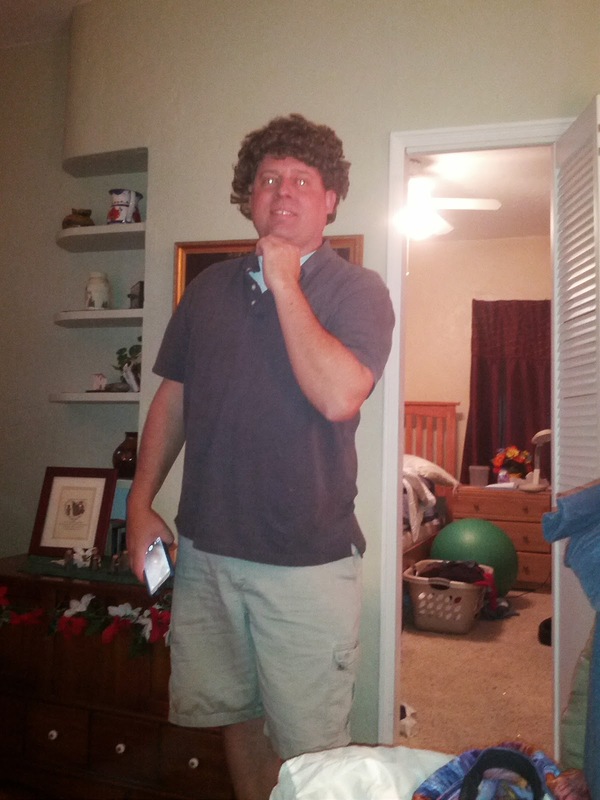 Justin was happy to reclaim "his" hair from the costume supplies. Nothing says Christmas worship like a little shepherd on a Harley. Ryan refused to wear any specific costume, but he really wanted wings, and he was happy to have his beloved blanket wrapped around himself. 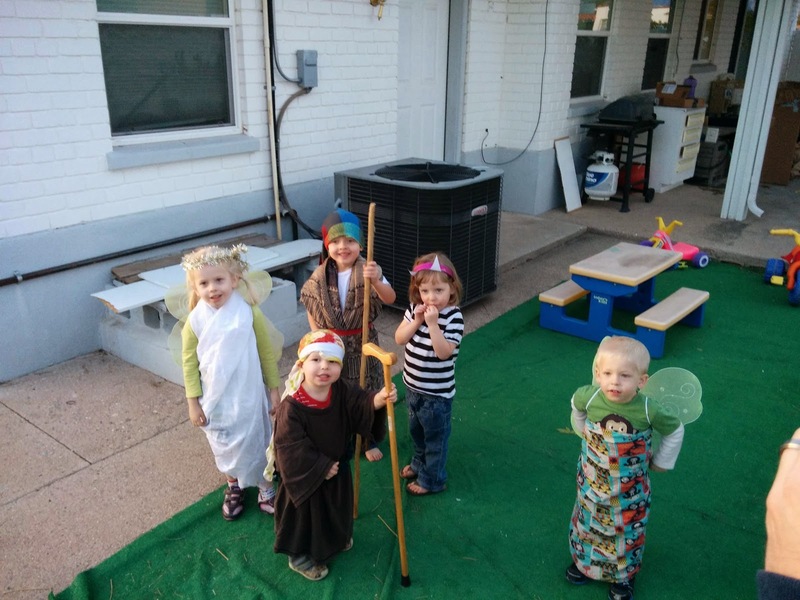 I believe that the end result was a costume we are calling shepherd with wings. Jared was Joseph and a wise man. Eloise was freezing, but she didn't want to mess up her costume. Here is the whole cast. After the big production, Rachel, Eloise and Annie sang "Away in a Manger," Rachel played "Good King Wenceslas" on the piano, and we watched a Christmas video. And then there was some costume swapping. 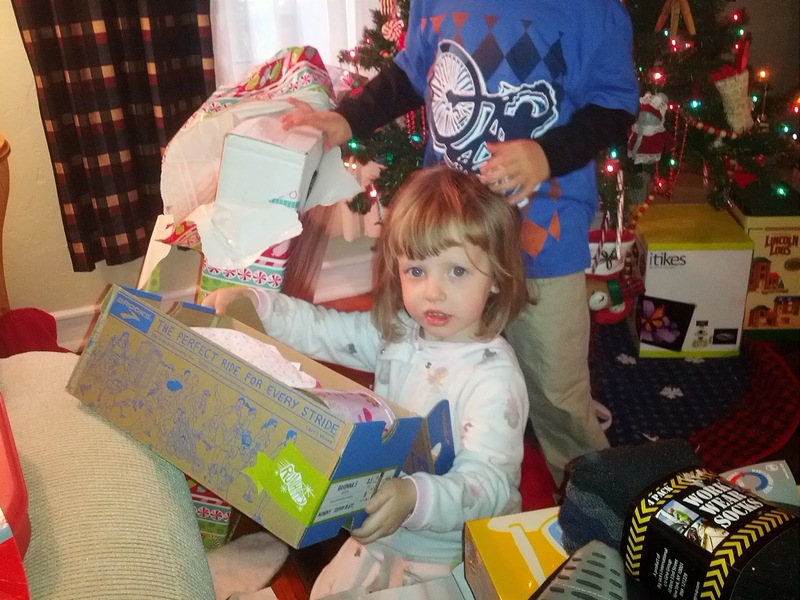 The cousins were in a hurry to get home and open their Christmas Eve present. 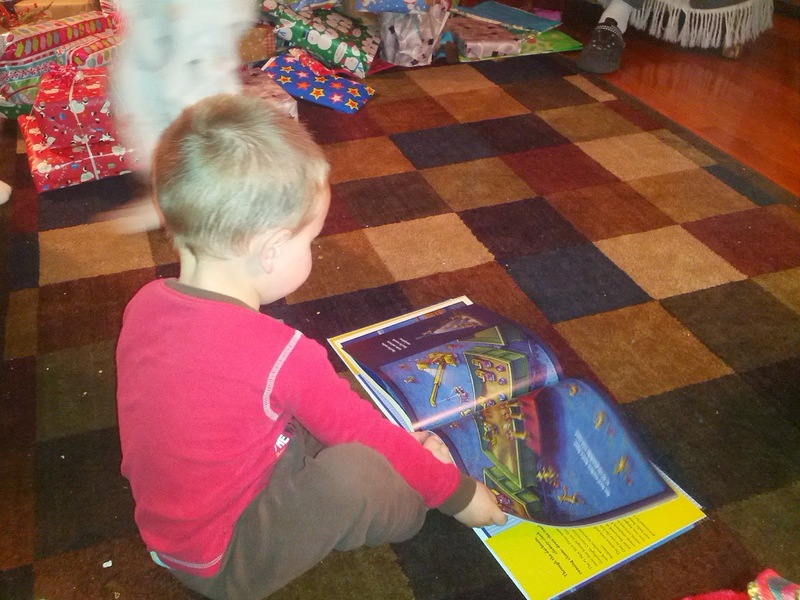 Jared, Eloise, and B each opened a book this Christmas eve. 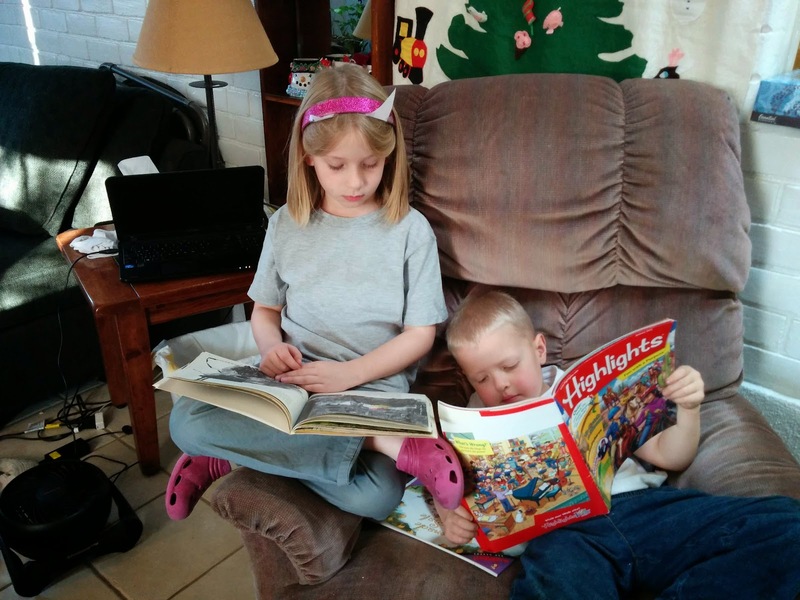 They set out a plate of treats for Santa, and a bowl of vegetables for the reindeer, labeled their stockings with nametags that they had made earlier in the day, read their new books, and went to bed. 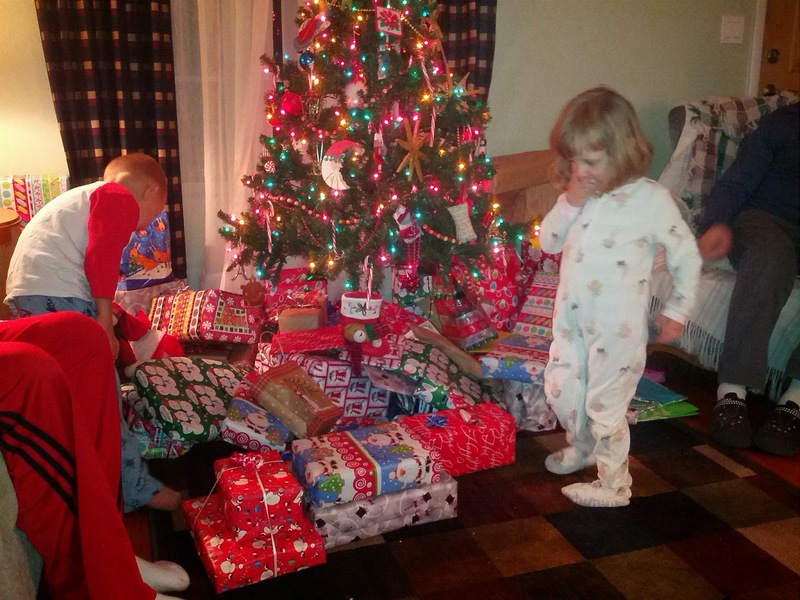 Look at the pile of presents they had waiting for them! It took up half of the room. 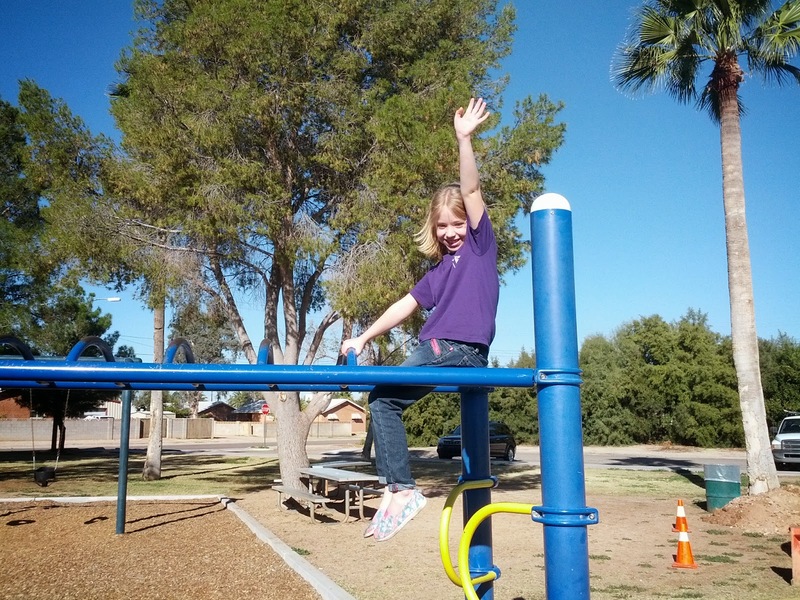 It has rained a little bit since we have been in Arizona, but the sun generally has everything dried out within a few hours, so the park has been delightful. 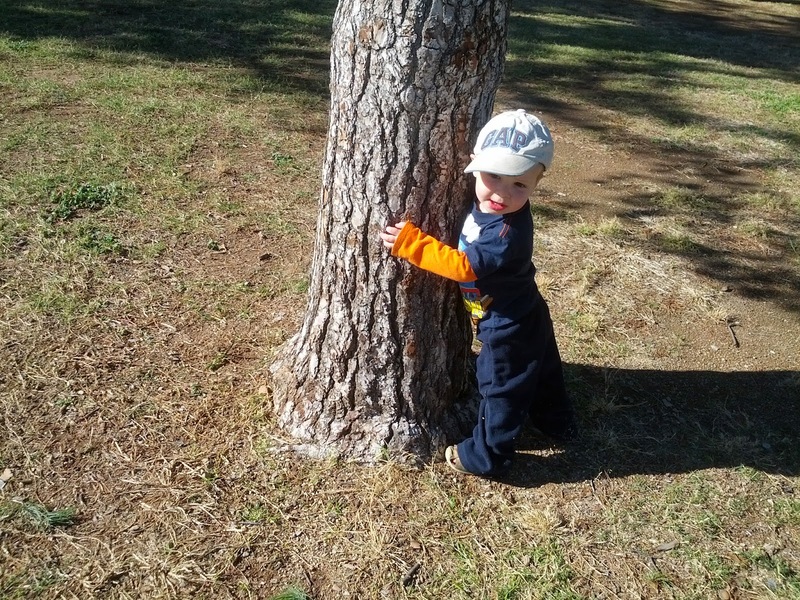 B is teaching these cactus hugging Arizonans a thing or two about hugging trees. 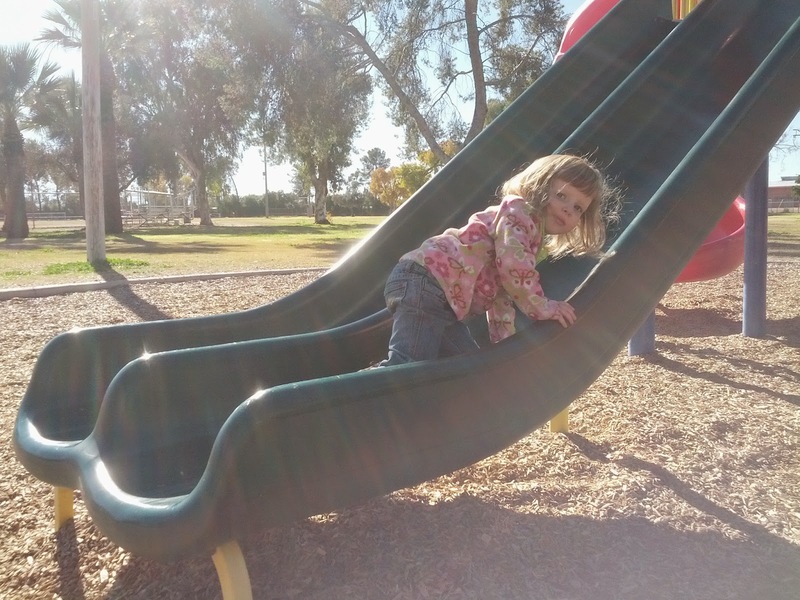 Eloise goes up, and then she comes down, and then she goes up, and then she comes down. 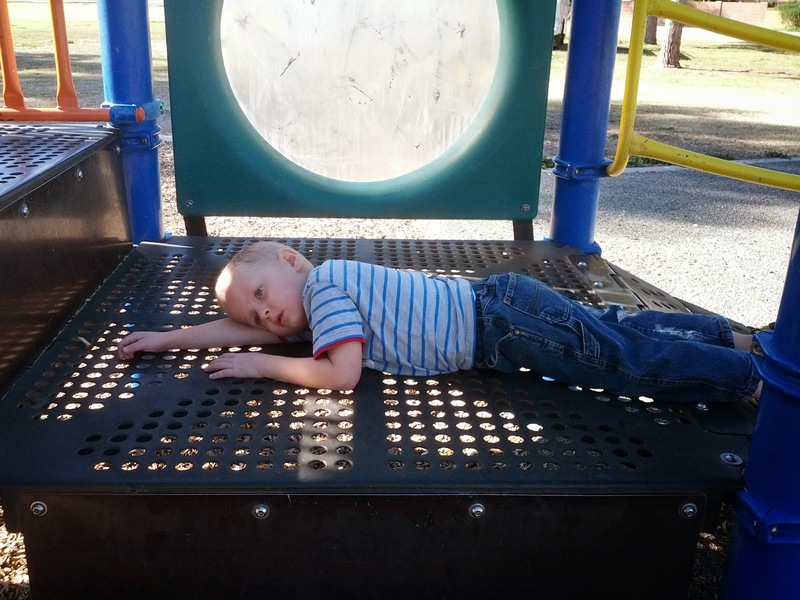 All of this outdoor play and sunshine makes Jared tired. The Campbell cousins are monkeys. We Knights usually try to keep our feet on the ground, or as close to it as possible. I love Rachel's pose in this picture. 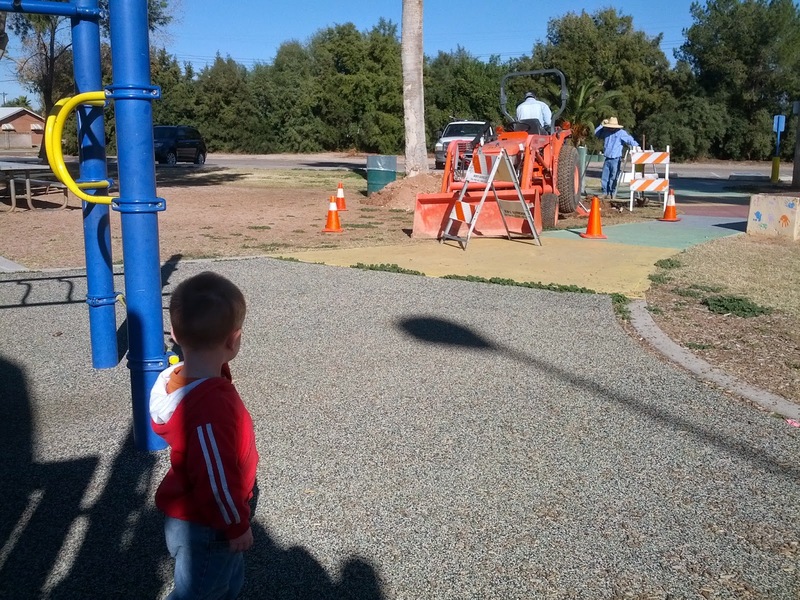 One day we went to the park and found a tractor digging near the playground. 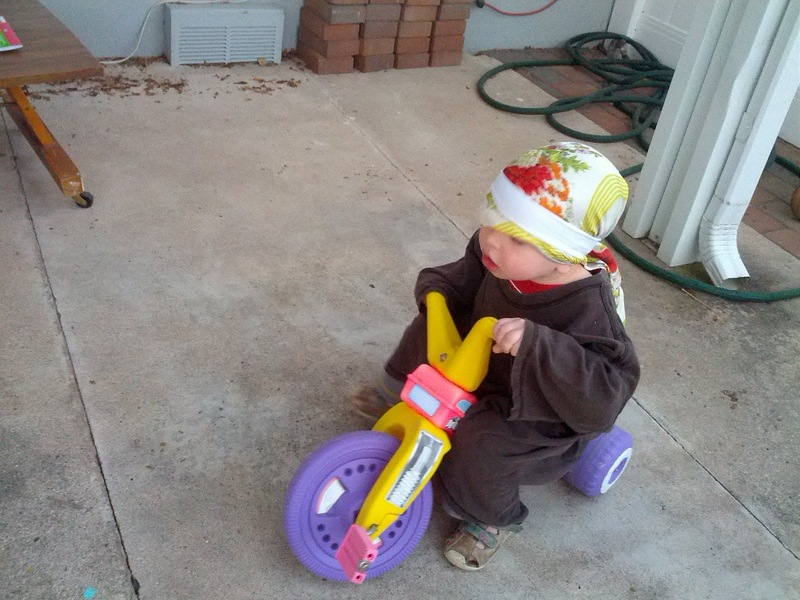 B stayed as close as he could to the noisy tractor action. When the workers took a break, Jared asked them why they were digging. They told him it was a hole to put their Christmas presents in. Sometimes Jared caves in to his urge to be as much like Rachel as possible and gets his feet a few inches off the ground. At least one foot will get off the ground. In a few months the Washington playgrounds will be this warm and dry sometimes, but probably not this sunny. 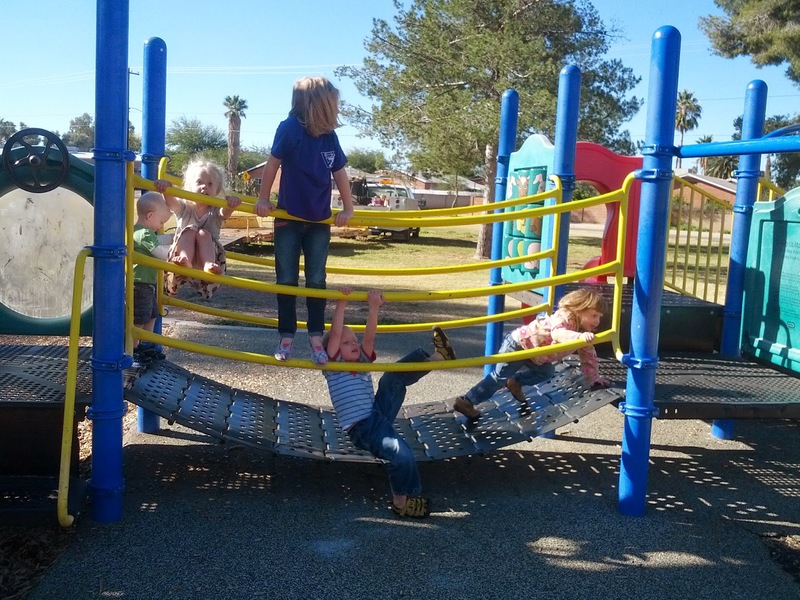 In a few months the Arizona playgrounds will be untouchably hot. 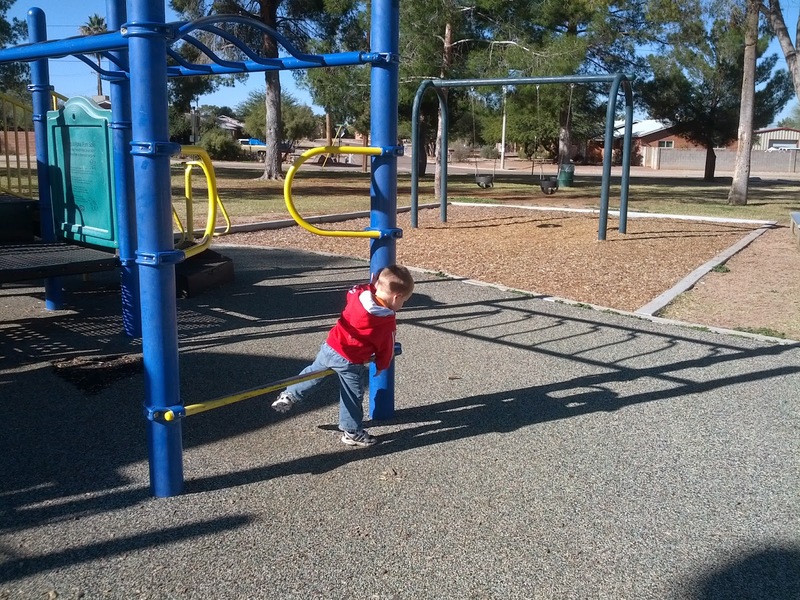 We will all enjoy these park days while we can. In the freezing cold we. . .